I’ve been weaning myself off of the barbell for a few months. I decided to change up my training and depart from the go-big or go-home approach. I’ve gone from high weight/ low repetitions to high reps/ lower weight. I cap my weight increases and change my tempo for a greater challenge. I’m exploring how this feels and listening to my body. Sometimes in a large class I feel a little bit on the outside because my goals might be different, not going for a personal record. But then I remember that everyone’s goals are different all the time. So I just do my thing. One reason I’m backing off the big weight is it does a number on my central nervous system. I’d like to minimize fatigue and brain fog. It’s been a stressful few months, and while I have lots of strategies and mechanisms for copying with stress, my reserves are low. A good strategy for me is to minimize extra fatigue from compound exercises like deadlifts. However, the personal records are important too, and I’m happy I have them. I’ve been reflecting on the value of the p.r. One of the greatest take-aways from the deadlift and rack pulls specifically is the byproduct of self-belief. Yes, fat loss, gaining strength, and feeling good are also amazing byproducts, but the unexpected result is self-belief. The surprise of this discovered confidence makes it even more of a gem. I’m a pretty confident person about most things, but most things I do, I do all the time. 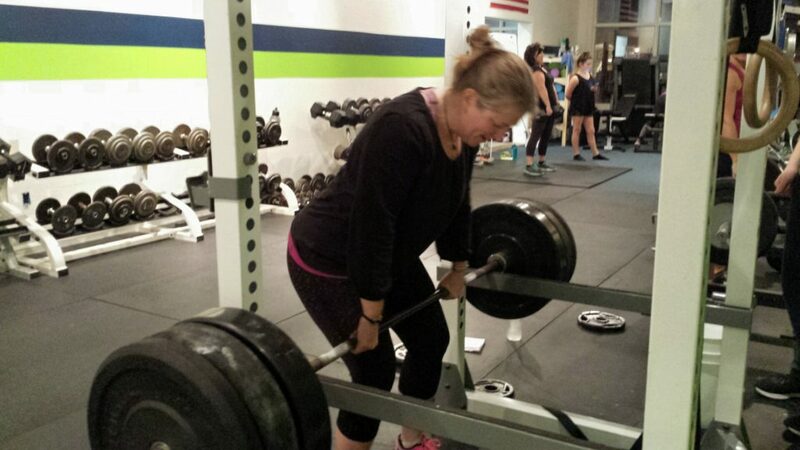 When it comes to the weight room, for the first year especially, most of it was new and most of it came with the thought, “I can’t do that.” I think many of us would agree that so quickly for all of us this initial thought becomes, “I can do that.” How exciting and empowering to have this new narrative. Honestly, sometimes we wonder if we will ever be able to get through the warm up without stopping, or do a one minute plank, wall sits, or bear crawls, let alone any weight lifting. But we do and we believe in ourselves a little more with each success. Cultivating your self-belief is a wonderful byproduct of attending a gym. What would you like to accomplish that you never thought you could, because you know what? I bet you can!